During my tenure in Cape Town, I lived in two noteworthy apartments, known as ‘flats’ to the locals and anyone from Europe. I also dated a guy who owned a house. Renting a flat or owning a house isn’t that much different there than it is here stateside. Outside of the optional 50-year mortgage (yes, you are reading that correctly, FIFTY YEARS to pay off a house. I don’t even want to know the interest rate on that. ), the main difference came down to that convenient, non-essential-yet-we-think-it’s-essential-utility known as electricity. ave electricity. Let me remind you again, not everyone lives in huts and makes their own weapons and dances around a fire. Way to stereotype, people. 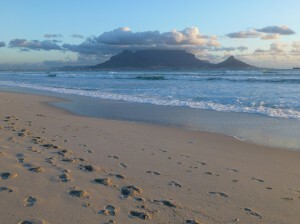 During the winter, my flatmate Paul and I rented a two bedroom furnished flat in Blouberg. It’s a small coastal town away from the city with awesome views of Table Mountain. We had a cheap rate since it was the off-season. However, there was no central heat (or air in the summer), and the thin walls did less to block the wind than a chain-link fence. It was so damp and cold, we had a third flatmate by the time we left named Fuzzy McMold. But I digress. In order to stay warm, we had a space heater. I also often made toast, which served two purposes. One, it added to the thick layer of subcutaneous fat I never knew I could so easily grow, and two, I warmed up my hands and arms over the slots during toasting. I also frequently took hot showers to thaw out my bones. All of these methods of staying warm required electricity. Why such a method? Maybe there were customers that refused to pay monthly bills, or maybe it was a way to minimize consumption. I know I tried to use less when I saw the kWh dropping with each piece of toast or shower. But my flatmate and I couldn’t figure out the power outages. Never had I experienced so many outages. Storm? No. Excessive heat or cold? No. Someone sneezed? Possibly. We had a set of candles at the ready since they were so frequent, and I remember typing a class paper on my laptop, hurrying to finish before running out of battery or the candle burning out. Paul said if we ever wrote a book chronicling our adventures, he’d title one chapter “The Power Goes Out…Again.” There was always one positive, though, about the power outages. Not one kWh used in that time frame. Cha-ching. Now I think I’ll go make some toast.